The recent political success of right-wing populists in the US and in many European countries is often attributed to a surge in anti-immigrant sentiments among broad parts of voter populations. Researchers, however, have struggled to understand the development of these hostile attitudes. What are key drivers and determinants? Can misperceptions be tackled? These questions are addressed in several recently published IZA Discussion Papers. Empirical data suggest that voters are often blatantly misinformed about the facts of immigration. 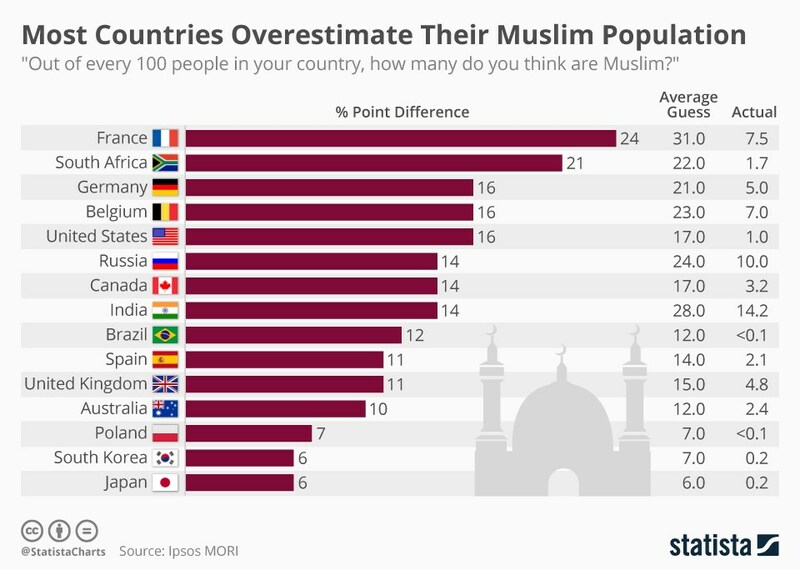 As an example, the chart above shows a high degree of misperception among people worldwide about the share of Muslims living in their country. Similar figures have been found for over-estimations of immigrant proportions in general. The good news is, people are willing to update their perceptions in response to newly provided factual information. This is the finding of an IZA Discussion Paper by Oxford economists Alexis Grigorieff and Christopher Roth with Diego Ubfal (Bocconi University, IGIER and IZA), who have studied whether providing official statistics about immigrants affects people’s attitude towards them. The researchers designed an online survey for the US in which all 800 respondents were asked to estimate a range of figures regarding immigrants, which they wildly overestimated: share of immigrants (estimated 22% vs. correct 13%), of illegal immigrants (14% vs. 3%), of unemployed immigrants (22% vs. 6%), of incarcerated immigrants (13% vs. 2%) and of non-English speaking immigrants (33% vs. 8%). Half the sample was then provided with the correct figures followed by a continuation of the survey and further questions about attitudes and policy preferences. The information turned out to have a strong effect on self-reported attitudes: Respondents provided with factual information were 30% more willing to donate to a pro-immigrant charity. However, the effect does not extend to political behavior, as no difference was reported with regard to signing a petition asking for more Green Cards (permanent residence permits). Those most affected by the new information were those most worried about immigration. Providing information displays a larger effect on Republicans than on Democrats. A follow-up survey a month later showed that the information effect persists. A second recent IZA Discussion Paper similarly demonstrates the power of information to counter misperceptions about immigration. Giovanni Facchini (University of Nottingham and IZA), Yotam Margalit (Tel Aviv University) and Hiroyuki Nakata (University of Leicester and RIETI) look at how broad information campaigns can decrease public opposition to immigration. They analyzed results from a large-scale experiment conducted in Japan, a country with widespread anti-immigrant sentiment. The researchers randomly exposed a large national sample of citizens to information pertaining to potential social and economic benefits from immigration. The findings reveal that the campaign led to a substantial increase in support for a more open immigration policy and motivated citizens to take political action in support of this cause. Notably, while smaller in magnitude, many effects also persisted 10-12 days after the information was distributed, which highlights the potential value of public information campaigns to combat negative attitudes towards foreigners. Attitudes towards immigrants, however, do not form on externally provided information alone. People also become more aware of immigrants by being exposed to their cultural and religious practices in public life. The IZA Discussion Paper by Tommaso Colussi, Ingo E. Isphording and Nico Pestel investigates how a change in “salience” of Muslim communities in German municipalities influences voter behavior, potentially increasing the level of political extremism. The researchers use unique data on the construction of mosques and election results in municipalities over the period of 1980-2013. The results indicate that the presence of a mosque increases residents’ political divergence from the political center. The negative effect of the presence of a mosque increases strongly if an election is scheduled right after the holy month of Ramadan, a period in which mosques happen to be much more visible to the general public due to extensive festivities and openly displayed religious practices. The findings show that vote shares for both far right- and left-wing parties become larger when the election date is closer to Ramadan. In addition, the change in visibility of the minority population increases the likelihood of politically motivated crimes against Muslims.